SUMMARY: Katie Tusing, a JMU alumna, returns to the classroom after a life-changing accident to teach her second-graders academic skills and life lessons. Katie Tusing (’09, ’10M) loves working with young children, especially her second-graders at Ashby-Lee Elementary School in Quicksburg, Virginia, the same school the Mount Jackson native attended. Seven- and 8-year-old students often learn by doing—arranging numbers cards in ascending order, trying out new vocabulary words with the aid of pictures, creating art with many fun supplies. Intangible concepts are trickier by their very definition—they cannot be easily defined. But Tusing enjoys the challenges of teaching, a career she began after earning a bachelor’s degree in health sciences at JMU. Intending to focus on physical therapy, she recognized that path was not for her. After her physical therapy clinic supervisor encouraged her to consider teaching, saying, “I see you teach patients every day in here,” Tusing returned to JMU to complete a Master of Arts in Teaching degree. Tusing’s talents as an educator were recognized by her colleagues when she was named the Shenandoah County Public Schools Teacher of the Year for 2017-18. It was the teaching year that almost wasn’t for Tusing. In January 2017, Tusing’s life turned upside down in an instant. Police investigators surmised that the first vehicle hit and damaged two utility poles, while the second vehicle hit a guy-wire, causing it to snap. “That wire kind of bull-whipped around and it hit me in the leg and it flipped Dillon,” Tusing says. Her assessment, based on pain level and seeing the damage to her leg (both the tibia and fibula were broken) proved accurate. After several surgeries and the onset of infection, the decision was made to amputate Tusing’s right leg below the knee. During 21 days in the hospital and at a rehabilitation center, Tusing had to “figure out how life was going to go on after that,” she recalls. She missed her second-graders and was worried that her teaching career might be over. Although the injuries kept her from returning to full-time teaching in the second semester, Tusing visited her children “because I felt like it would be good for them and for me. They just had a lot of questions that they needed answered,” she recalls. That honest exchange cemented Tusing’s decision to return to the classroom. After a slow healing process delayed Tusing’s fitting for a prosthetic leg, it was August 2017 before she was able to return. She finally determined that her situation offered learning opportunities for her students. “I felt in my heart that there are a lot of kids here in this school who probably haven’t had a lot of exposure or experience with people who have an obvious physical disability. I use my situation as a gateway to help my children understand we all struggle with different things, some that we cannot see. “We talk about how it’s important to be kind to everybody because you don’t know what they’re dealing with. We talk about how I got frustrated when I was learning how to walk again because it wasn’t easy, how I had to keep coming back to it and keep trying and keep working until I got stronger and better. I explain that’s the same thing as something you’re learning that’s hard for you, whether it’s reading, math, whatever. You’ve got to be persistent and you can’t give up. “Other lessons I’ve learned and try to impart to my students are the value of being adaptable and empathetic. I certainly have real, tangible examples to share with my kids,” she says. 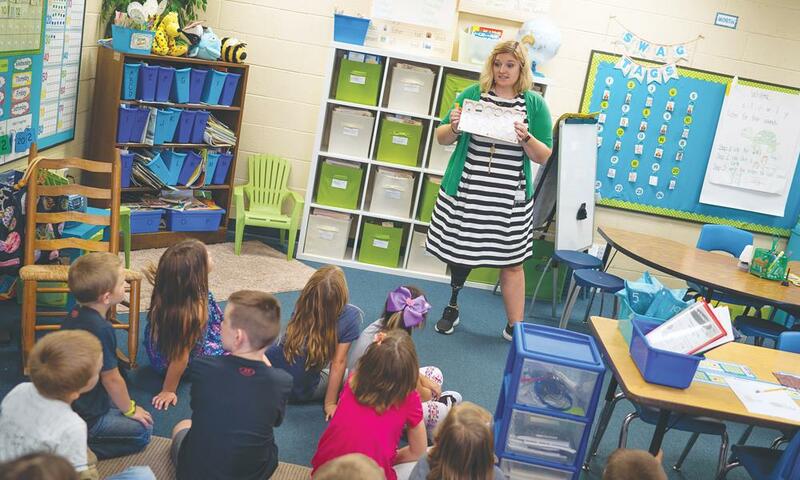 When some of her students were confused by the realistic appearance of her prosthetic foot in comparison to the mechanical look of her lower leg, Tusing invited her prosthetist to the classroom to explain how the artificial limb worked. 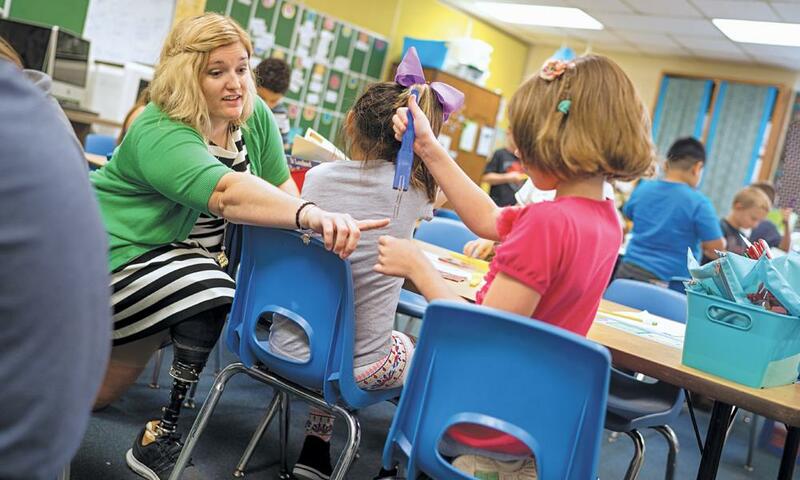 The 2018-19 school year has begun with a new class of second-graders and their award-winning teacher who is enduring less physical pain than a year ago.